When asked about his journey to becoming an umpire, Fieldin Culbreth III says his story is no different than most little boys. "I wanted to play baseball. I sat in the backyard and dreamed of the 9th inning with bases loaded, 3-2 count, and then I hit out if park. I had no idea I would be calling a strike or a ball. I dreamed of being a player." With a name like his, the umpire known as “Cubby” is one you won’t easily forget. His father, Fieldin Henry Culbreth II, told him that during the Civil War two young soldiers became good friends and made a pact to that if anything were to happen to one of them, the other would tell their family. Sure enough, one died in battle and the other went back and reported it. The second man became a part of the kids’ lives, helping them throughout their childhood. One of the youths the soldier helped raise was extremely appreciative and loved this man and everything he stood for. When that child grew up, he had a son and named him Fieldin after the soldier who helped his family. That new baby was Cubby’s grandfather. Culbreth’s college baseball coach, Gary Robinson, happened to have been a professional umpire at one point. Per the recommendation of his coach, Culbreth decided to go to umpire school—and one of his college teammates decided to go with him. Culbreth went to Joe Brinkman’s umpire school and five weeks later he and his teammate, Eddie Bean, were selected to go to the next level. “With 130-140 students at the camp and only 12 going on to the next round in Bradenton, Eddie and I were surprised we both made it.” He and Eddie are still great friends to this day. On his path to MLB, Culbreth umpired in the Gulf Coast League, the South Atlantic League, the Southern League and the Pacific Coast League. After being in the Pacific Coast League for one year, he started working up and down in the big leagues. 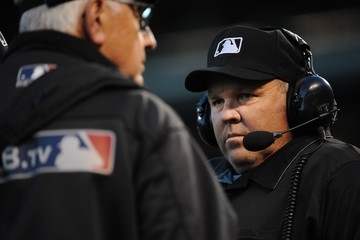 Since he was 22, Culbreth explained, the only job he’s known is an umpire. “I did 101 jobs before I went to umpire school,” he said. “I worked at a loading dock, in the orchard, boxing peaches, they were just filling jobs to make money.” But that night was the fulfillment of a dream—just not the one he had as a little boy. Culbreth has been involved in the charity since its infancy, working with Marvin Hudson to do meet and greets with Big Brothers/Big Sisters back when it was still called Blue for Kids. “I loved the concept of it,” he said, and he’s been hooked since then, getting involved in all aspects of the charity.